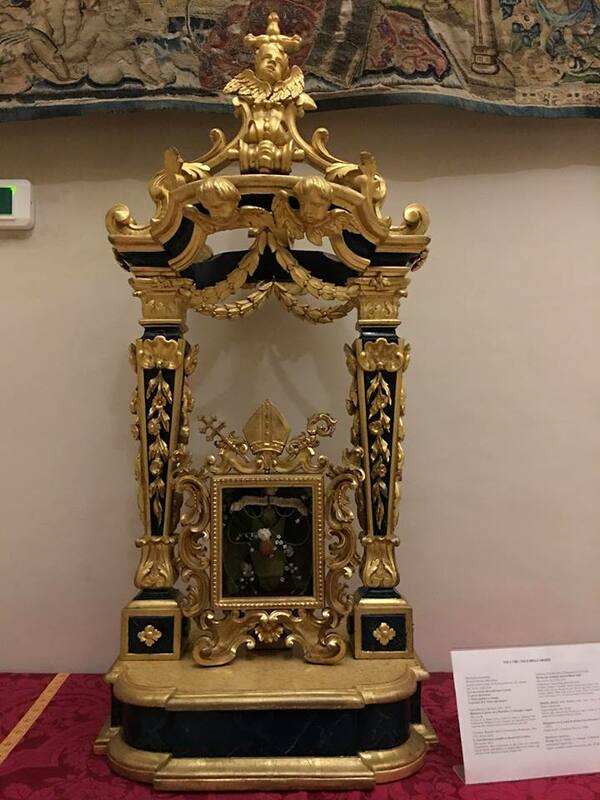 Our thanks once again to Fr Adrian Hilton of the Cincinnati Oratory for sharing with us these photos from his relic collection, this time of St Charles Borromeo, whose feast is today. 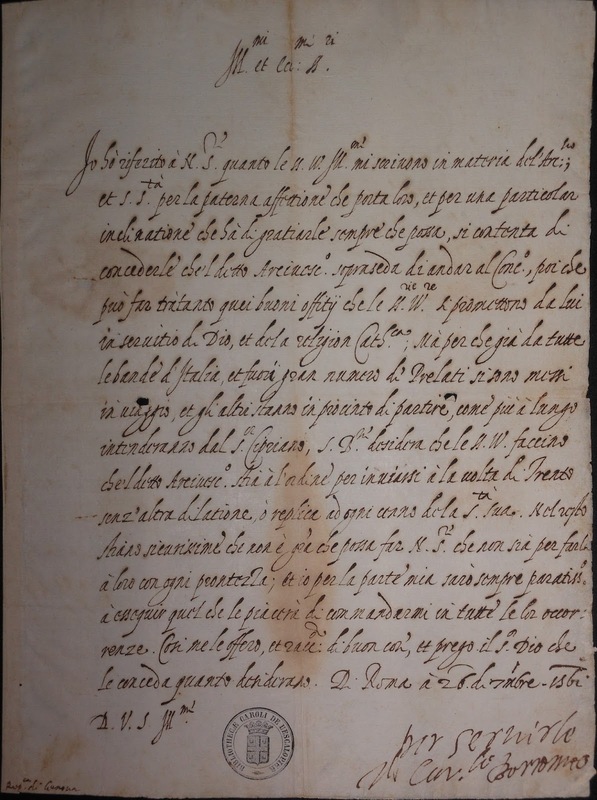 It is a letter written and signed by the Saint on December 26th, 1561, in which he communicates to certain persons that the Pope has given permission to an archbishop to delay his departure for the Council of Trent, in order to attend to some business matters of great importance to said persons. 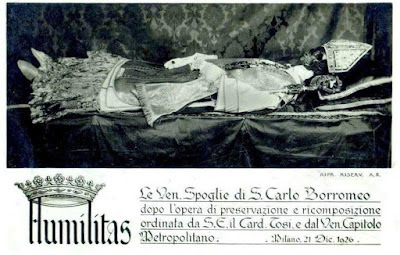 At the time, St Charles was only 23 years old, and although not yet ordained a priest, had already been appointed a cardinal, and administrator of the archdiocese of Milan. 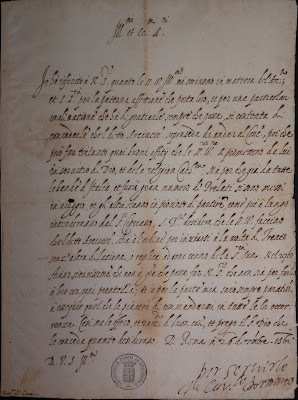 He was retained by his uncle, Pope Pius IV, in Rome, and constantly occupied with the affairs of the Church, not least among them the push to reconvene Trent, which at that point had been suspended for almost 10 years. From our Ambrosian correspondent Nicola de’ Grandi, here are two historically interesting photos. 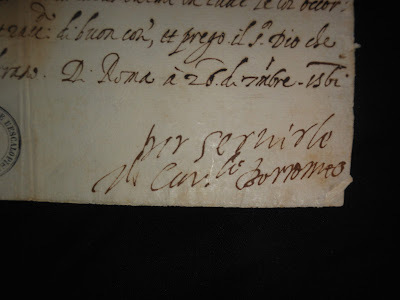 (And my thanks to him for deciphering the letter!) The first shows the relics of St Charles as they were formerly seen in the crypt chapel of the Duomo of Milan. In 1957, Archbishop Montini, the future Pope Paul VI, ordered that the skull be covered by a mask with the likeness of the Saint’s face. 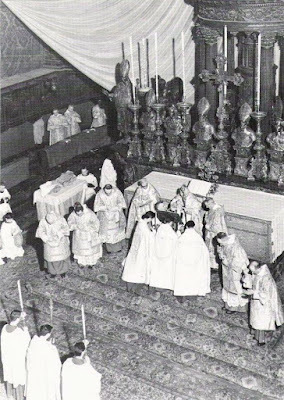 This photograph shows the Blessed Ildefonse Schuster giving the solemn blessing at the end of a solemn Pontifical Mass on November 4th. 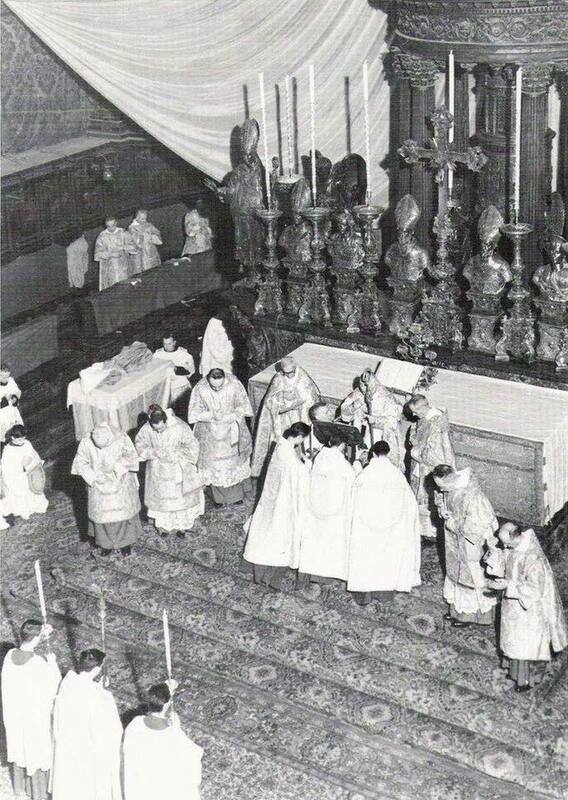 The silver statue of St Charles seen on the far left of the altar was formerly placed on the Gospel side only for his feast day; it is now permanently left in the church. 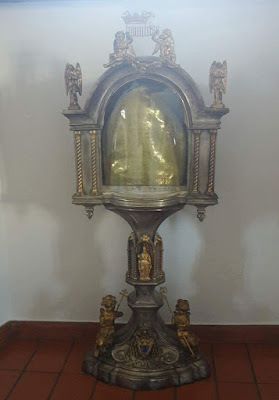 And several more relics of St Charles from various places: first, a biretta kept at the Collegio Papio in Ascona, Canton Ticino, Switzerland. The boundary between Ambrosian territory and the Roman Rite diocese of Como passes through the college’s church; therefore, the main altar on the Ascona side is Ambrosian, and the altars of the chapels in the nave are Roman. 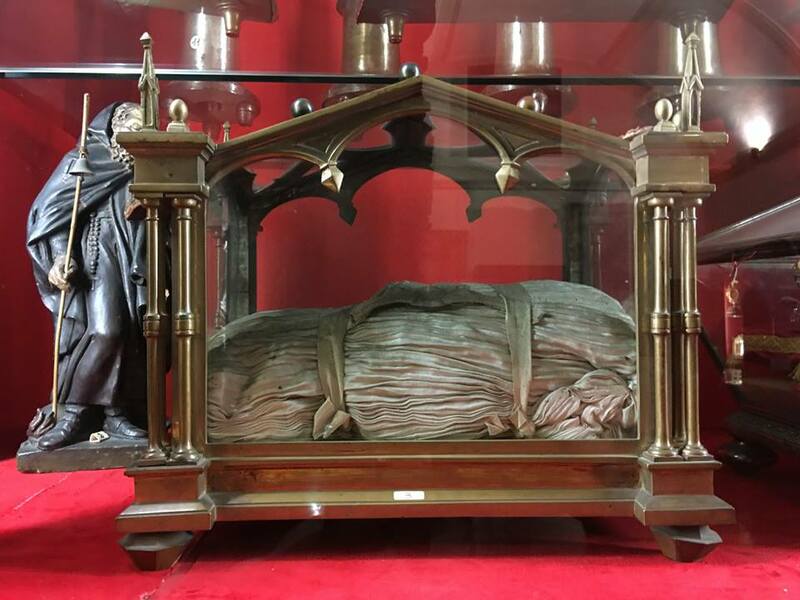 St Charles left this biretta behind in Ascona while traveling back to Milan during his final illness, dying just a few hours after returning to his episcopal city. A golden mitre now kept in the cathedral of Lugano, in the Ambrosian Rite territory of Switzerland. 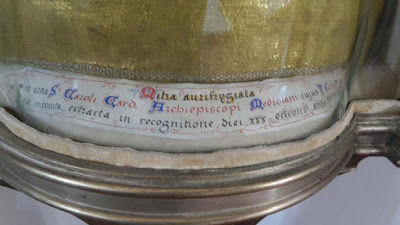 Part of a shoe, now at the Sanctuary of the Holy House of Loreto. 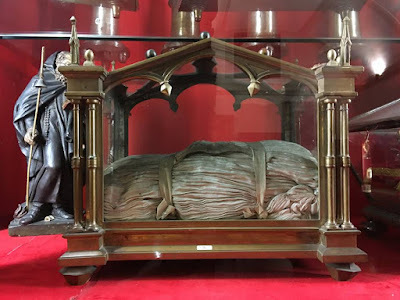 A rochet, now at the Basilica of St Eustorgius in Milan. 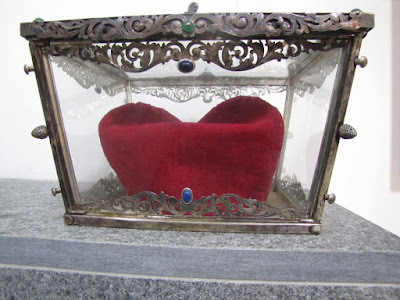 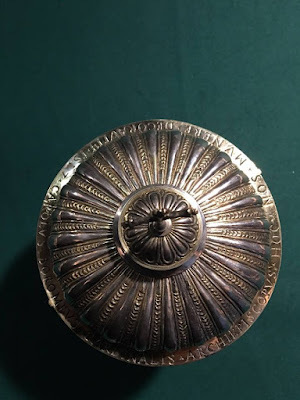 Finally, from an old post by John Sonnen at Orbis Catholicus, here is the reliquary containing St Charles’ heart at the church dedicated to him and St Ambrose on the via del Corso in Rome.